The country has set a very lucrative solar Feed in Tariff which can give an IRR of over 30% to solar power plant developers. This has led to great excitement amongst top solar panel manufacturers who are facing massive competition in other markets. The prices of solar panels has crashed by more than 50% in the last one year and led to numerous bankruptcies. With Japan predicted to be one of the fastest growing markets in the world in 2012, big solar module suppliers have turned their attention towards the Japanese home market. Big Japanese solar module makers like Panasonic, Sharp have been left far behind in the last 5 years by cheap Chinese companies who have pushed out the Japanese, from the top 10 rankings. The cost base of the large Chinese players like Trina, Yingli is far below that of the Japanese producers of solar cells. The Japanese Government officials are fearing that their local market will be swamped by the much more competitive solar modules from Taiwan, Korea and China without benefiting the local solar manufacturing industry. The Government is planning to erect barriers in the entry of the foreign solar panel suppliers in order to protect the domestic industry which gets most of the revenues from the domestic market. 1) Sharp – Sharp,the Japanese Zaibatsu known more for its Electronics Products is also the world’s No.1 Company in terms Solar Module Revenues. Sharp has been the solar world leader since the past 4-5 years despite stiff competition recently from upcoming Chinese Crystalline Solar (c-Si) players and Thin Film Leader First Solar. Sharp’s c-Si division is not cost competitive with the Chinese and Taiwanese companies as its cost structure is almost 30-40% higher than the cheapest Chinese producers. Though the quality of Sharp’s crystalline silicon modules is considered much better, the cost difference has become too big in a rapidly commoditized industry. Sharp has started shipping a-Si modules from its 1 GW capacity plant in Sakai. With its established distribution strengths and technological abilities in LCD Technology, Sharp is one company that can survive the c-Si onslaught. 2) Sanyo-Panasonic – Sanyo’s solar panels possess the cutting edge technology. 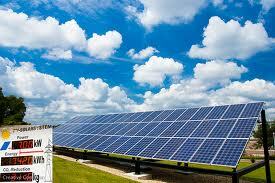 Its solar panels with proprietary HIT technology rival the best in terms of efficiency and quality. Panasonic after acquiring Sanyo has completely changed its strategy to become a major Green Player targeting a Major Percentage of Sales in the future to come from Green Products. Panasonic which is the world’s biggest Plasma TV producer is going to spend $1 Billion on Green Building investments. Panasonic will combine its Green Strengths with Sanyo’s to sell a complete Eco-Friendly Home complete with Solar Power, LED Lighting and Energy Storage and Efficiency capabilities. In Solar where Panasonic is the No. 3 player in Japan behind Sharp and Kyocera, it is speeding up the expansion of solar capacity. It will spend more than $500 million aiming to triple its energy solutions business in Europe to 800 Million Euros by 2016. 3) Kyocera – Kyocera is Japan’s second largest solar panel producing company. The company recently won a major contract to build a solar farm in Thailand. Unlike other companies it has been slow off the blocks and unless it perks up its game,it is likey to become a even smaller company in the global scheme of things. 4) Mitsubishi – Mistubishi is another old time Japanese solar company which has a low profile solar module and system business. The company is known for its high quality panels and has a decent presence in USA and Japan. However like Kyocera it has not been aggressive enough leading to loss in marketshare. 5) Mitsui – Mitsui Engineering and Shipping, one of Japan’s huge zaibatsus is planning a foray into the solar energy market as well. The Company is being supported in its initiative by METI which will collaborate with the Tunisian government in setting up a combined gas solar hybrid plant. A 5 MW Solar CSP plant will be set up by 2013 to demonstrate the technology. The company also owns a solar system business in the US after acquiring Sunwize. 7) Honda – Honda, the Japanese auto giant has also joined the Solar Energy Race by selling Thin Film Modules based on CIGs technology. Japan’s conglomerates like Sharp, Kyocera, Mitsubishi and Panasonic already have big solar manufacturing operations with Sharp being the largest Solar Company in the World.Honda which has a small presence in the Solar Energy through its subsidiary Honda Soltec is expanding its lines of modules for the domestic market. 8 ) Solar Frontier – Solar Frontier is a subsidiary of Showa Shell Sekiyu and is listed on the Japanese Stock Exchange. The Company has big plans for the Solar Energy Market planning to increase its capacity by more than 10 times in 2011 to around 1 Gw in total. All its 3 plants are located in Miyazaki in Japan and uses previous plasma plant of Hitachi. Solar Frontier claims 11.5% efficiency for its CIS modules which are expected to go upto 14% by 2014. It has signed a distribution deal with GE to sells its Copper Indium Selenide (CIS) Panels in USA. 9)Tokuyama – This Japanese producer has been in the game for long but has been the slowest in expanding capacity. Its building a new plant in Malaysia but its capacity has been dwarfed by newer players in Asia like OCI Chemicals. It has missed out on a huge opportunity. The company mainly supplies to semi wafer companies. However with the setting of a crazily high Feed in Tariff of 52c/KwH, solar demand is set to increase exponentially in Japan. Note Japan is already one of the biggest markets globally and has a large solar manufacturing industry. This is despite their much higher solar panel costs and prices compared to the global leaders like Trina. The reason is because of implicit barriers that Japan erects. Non-Japanese companies like First Solar, Sunpower have not been able to penetrate the Japanese market in a significant way because of these implicit hurdles. Note this is common to other markets and industries as well like LCD, computers, mobiles, rice etc. On July 11, the Korea Trade-Investment Promotion Agency (KOTRA) organized a business fair in Osaka where South Korean companies that manufacture energy conservation and environmental products displayed and explained their products. Although South Korean companies have fallen behind their Chinese rivals in the production volume of solar cells, they are apparently seeking to greatly increase their international competitiveness by entering the Japanese market, which is expected to rapidly expand with the introduction of the feed-in tariff system. As the feed-in tariff (FIT) rate of JPY42 (US$0.53)/kWh offered by the Japan Government for installing solar PV systems has attracted many foreign suppliers of solar products which are significantly more competitive in price than Japan-made products, the subsidization is not expected to substantially benefit Japan’s solar industry, according to industry sources. For this reason, the Japanese Government is expected to lower FIT rates as well as set tangible or intangible barriers to block imported solar modules in March 2013 (the last month of 2012 fiscal year), the sources pointed out.